In an acute triangle ABC, the median AM is longer than side AB. Prove that you can cut the triangle into three parts out of which you can construct a rhombus. Dien's solution (see also his post elsewhere) assumes that the three parts mentioned in the problem have been obtained by straight line cuts. I believe this is a very natural interpretation with which I am in complete agreement. The applet implements Dien's construction. To lead to a rhombus, the cuts from points E and F to BC need to be EF/2 in length; otherwise, the resulting shape is a mere parallelogram, not a rhombus. At the bottom of the applet there are two scrollbars. The first rotates two triangular pieces around two vertices. The second scrollbar controls the slant of the two cuts. The cuts originate at the midpoints of two sides adjacent to a selected vertex. Pressing the "Rotate vertices" button will cycle through three vertices of the triangle changing the selection. With the box "info" checked the applet will display the approximate measures of the angles in degrees and state whether the condition of having a median longer than a side holds at any of the vertices. Finally, it also displays the length (h) of the A-altitude and a/2. For the construction to work one needs h < a/2 to hold. When the "hint" box is checked the applet displays two circles centered at E and F with the radius EF/2. The points of intersection of the circles with BC are the points to which the cuts should be made from R and F. Sometimes there are two pairs of solutions, sometimes there is just one. On occasion, the circles do not cross BC at all. 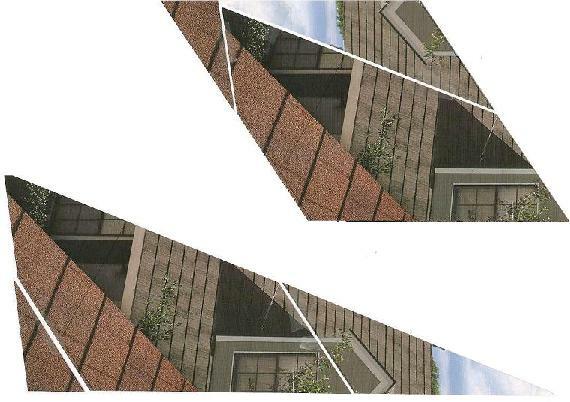 In the latter cases, the construction fails to produce a rhombus. The construction fails regardless of the selected vertex, although the premises hold at any of them. a/sinα = b/sinβ = c/sinγ = 2R. h = b·sinγ = 2R·sinβ·sinγ. which needs to be considered cyclicly. However, one must not forget the basic requirement, viz., AB < AM.